When most people look at a building, they focus on the parts of the building that are in front of them: the interior and the exterior. However, at Solid Foundations, when we look at buildings, we focus on the parts of the building that are below us: the foundation. Most people don’t know that the foundations can wear out and, similarly, that foundation repair is actually possible. The foundation is essential to any living and working structure, and therefore, maintenance of the foundation is crucial. Without a foundation, the building will collapse and leave buried beneath its rubble the pieces of many broken businesses, families, and lives. The mission of Solid Foundations that furthers our goal of helping people is to find an affordable solution to our clients’ problems. At Solid Foundations, we focus on the foundations of buildings because we want to prevent this kind of disaster in the lives of our clients. Our ultimate goal is helping people, and we know that protecting the investments of time, money, and memories that many people make in the homes they live in and the companies they work in would be an immense help to them. The mission of Solid Foundations that furthers our goal of helping people is to find an affordable solution to our clients’ problems. We are resolved to restore the safety and comfort of our clients with results that keep both their buildings and budgets intact. Solid Foundations was built not only to save residential and commercial properties, but also family and business pocketbooks. In order to accomplish our goal and fulfill our mission of foundation repair in Florida, we have to focus on the foundation of our own company, which is our experience and expertise in the industry. The groundwork we have laid that equips us to help people and solve their problems is the construction background we have built up for twenty-five years. Solid Foundations is a company constructed on the backs of a hardworking family who live and breathe this very specialized form of construction and feel unspeakably blessed to be able to do something we love for the good of others. We are thrilled to employ our knowledge of the foundation repair industry for the sake of our clients every day because the knowledge that we have is extensive. One of our most valuable resources that we use to complete every project is our skill in soils engineering. Soils engineering enables Solid Foundations to address any type of foundation repair problem found below ground: problems such as ground subsidence, weak soils, and sinkholes. We thoroughly explore and understand the geology and engineering properties of every site on which we work, and with our scientifically refined techniques, we are able to remedy most every foundation and ground issue as well as hazardous subsurface conditions. With our mission guiding us and our knowledge equipping us, Solid Foundations knows that we are set to succeed. We have built our company and our lives on a worthy foundation, and from there, we can perform the foundation repair of residential and commercial buildings and solve many other foundational issues in order to serve the beautiful and beloved communities of Florida. 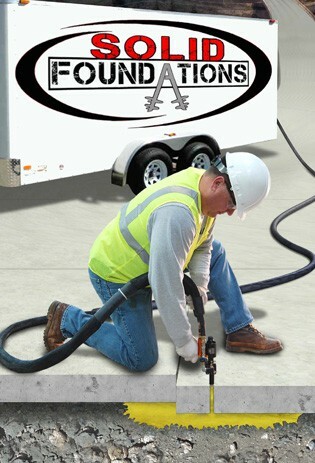 No matter what your problem may be, Solid Foundations is here to put you back on solid ground, so let us do so today.